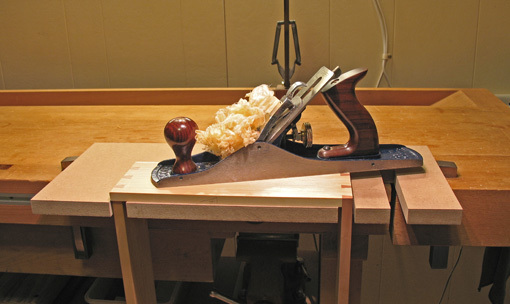 It is almost impossible to do good woodworking if the work piece is not properly held. Securing partly assembled work poses more challenges; drawers are a good example. After the drawer is glued up but before the bottom is installed, the joints must be cleaned up and the assembly incrementally fitted to its opening in the case. I use the drawer board pictured here, hardly original, made in a few minutes. The notches allow the drawer to slip in and rest on its front, back, or side with nearly 100% support of the surface being planed. 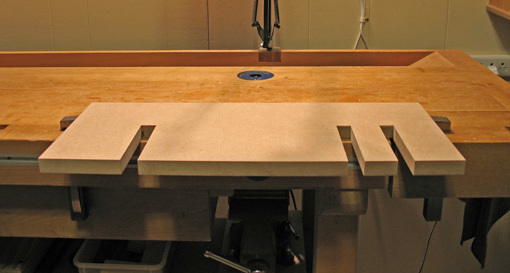 The leading face of the drawer butts against the stop while the front edge of the bench provides lateral control. The work is repositioned quickly and easily, an important feature for me. A drawer board without notches would catch the drawer on a trailing surface which doesn’t give me a good feel for planing, and the front and back are not afforded the same length of support as the sides. If I had a bigger piece of MDF handy, I might have made the board wide enough to be clamped at the back of the bench, but the metal bench dogs adequately hold this version. In this situation, I wish I had a Bob Lang style bench with a space in the middle of the top. By the way, planing a drawer to fit the case rates, for me, as one of the fine quality experiences in woodworking. A simple jig like this makes the work even more of a pleasure. That is a great jig. I wish I had thought of it and you can assume that, from now on, all drawers that I may make will be squared out using copies. Thanks for the comment. 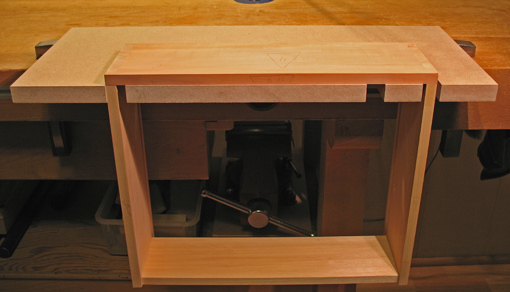 As you know, drawer making is finicky work, but it’s sweet work when it flows along, and I hope this jig helps.